A whole country covered in pink flowers! If you consider going to Japan, why not choose the most beautiful time of year? 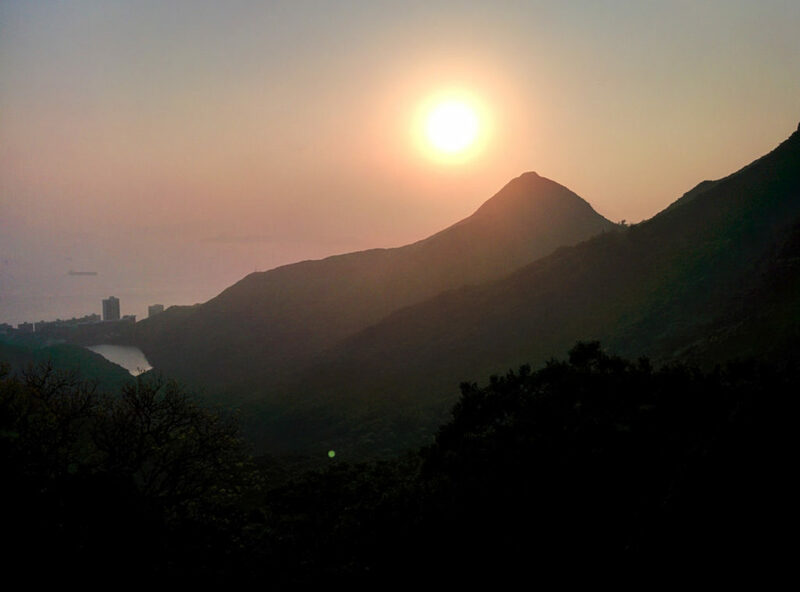 This post about Hong Kong will be the first in a 3-part series about my travels to Asia. 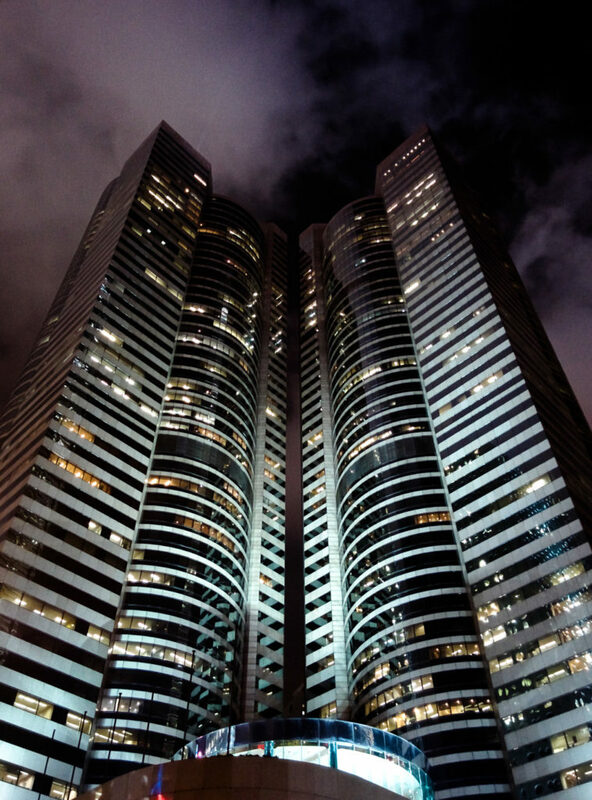 Next week will be about Japan and the week after about Singapore. Before actually going I talked with a colleague about Hong Kong. He told me that it feels like going to the future! After almost missing our connecting flight in Delhi, India, because of the somewhat too relaxed atmosphere of the 6 guys at the airport counter, we ran through the airport like crazy people, jumped the plane and landed in a shiny futuristic paradise. 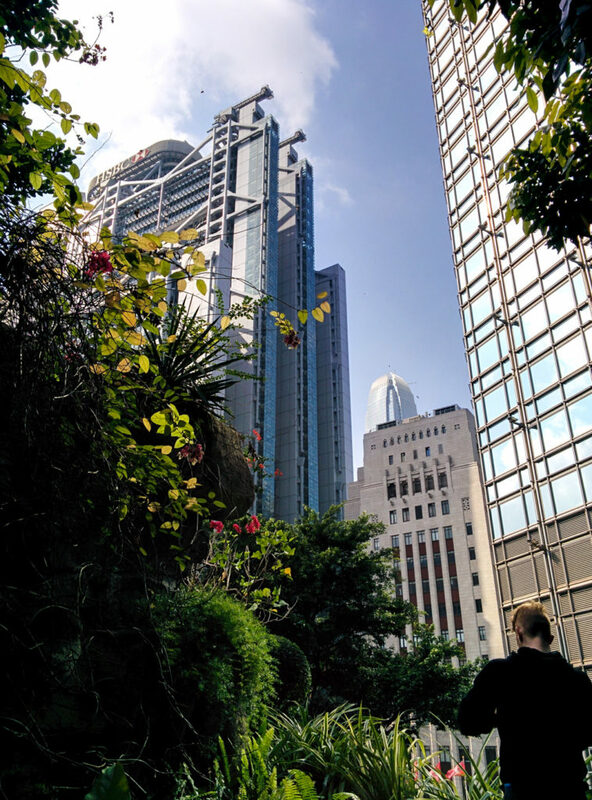 Hong Kong is a city of pure contrast! It’s a weird mix of grungy old and the high-tech neo-future. You walk through dirty little side streets with weird smells and suddenly find yourself surrounded by neon-lit skyscrapers that look straight out of science fiction cartoons á la Akira. You take a bus and are transported back in time suddenly visiting temples surrounded by jungle. Food is around every corner – No matter how late your hunger strikes! If I’d need to put myself into a spiritual category I feel most comfortable with being Buddhist. Especially self-development is very important to me. The last 1.5 years I went to a several classes about Buddhism and Meditation. 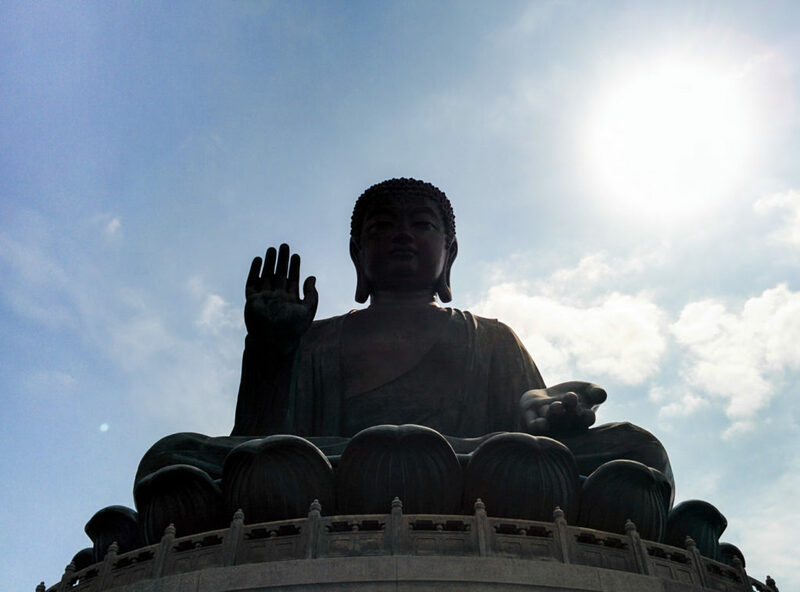 When I went to Hong Kong it was really cool to visit the giant Buddha. 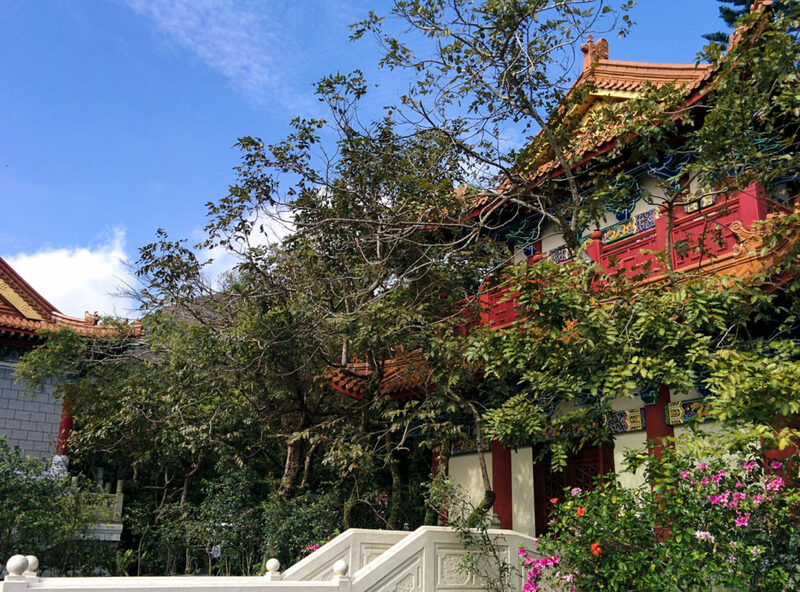 Thought the whole scene felt quite touristy, I enjoyed visiting the 35 meter tall Buddha statue and the serenity of the surroundings. Makes you feel so small and humble. Suddenly back in time again and surrounded by green forest. The first temple I visited in Asia, turns out there will be dozens more! 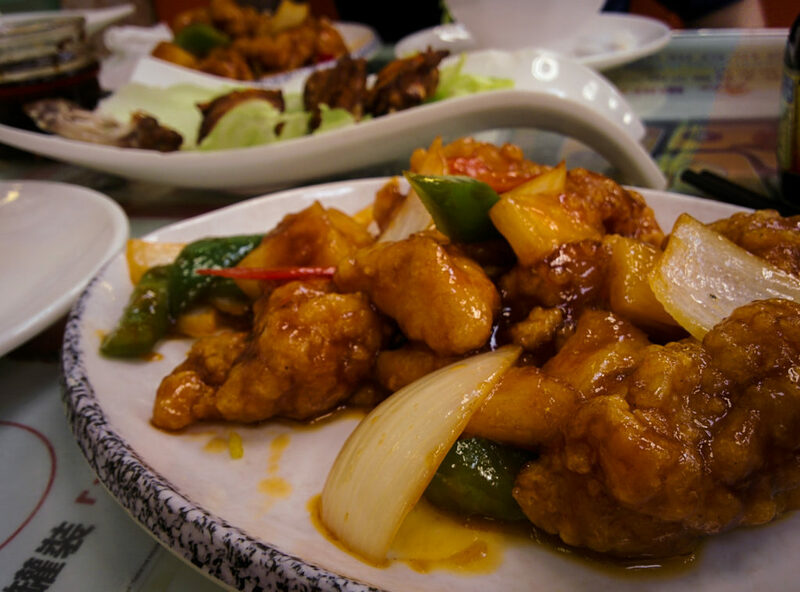 For foodies like you and me, Hong Kong is an absolute heaven with its 24/7 food culture. 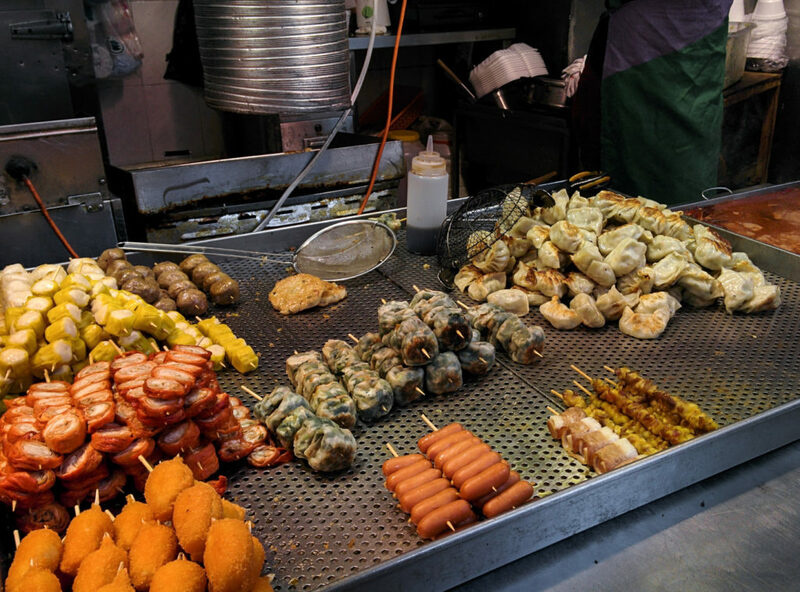 Small little food carts, vendors and stands everywhere – especially at night. 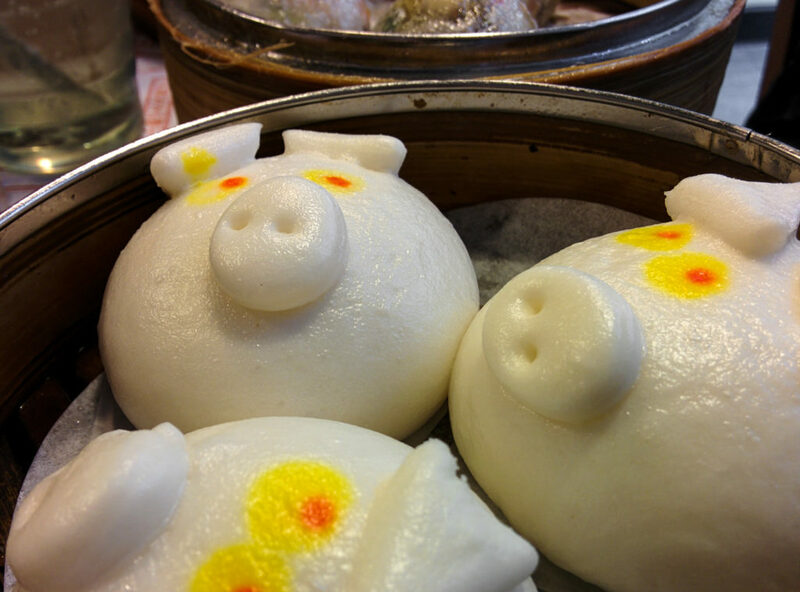 Next to all the different small little dim-sum treats you can find a lot of other delicacies in the streets and restaurants. Ever tried roasted pigeon before? 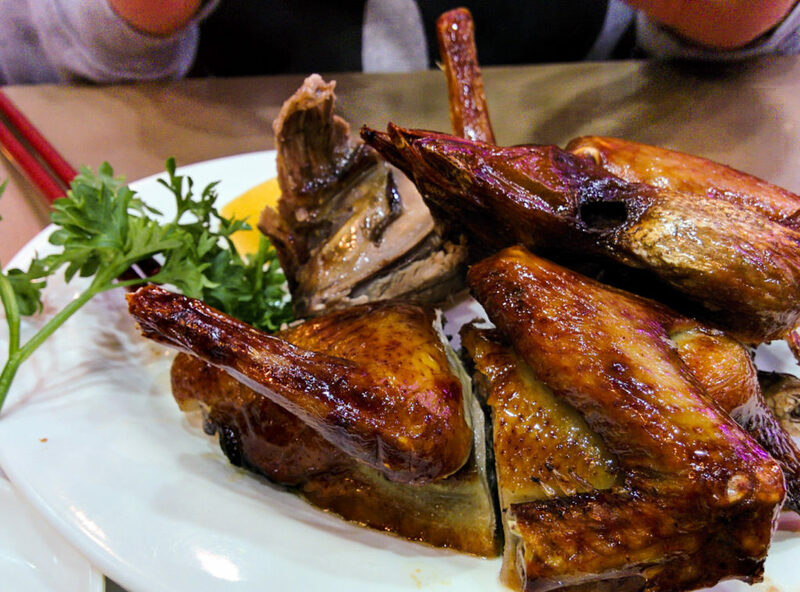 It tasted like the grown up brother of roasted Peking duck. Rich and slightly gamy, but in the best way possible! 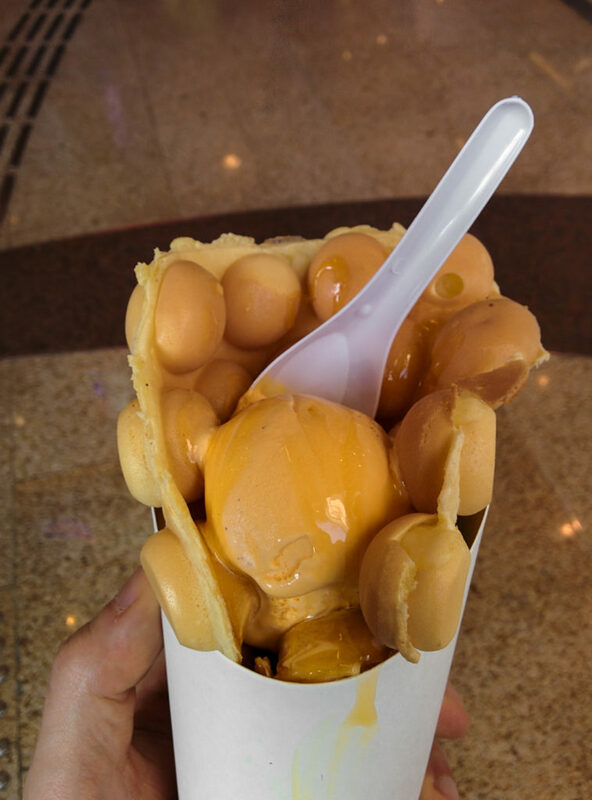 Gai daan jai – Fluffy egg bubble waffle with delicious mango ice cream, drowsed in sticky mango syrup. Perfect for a warm summer evening! After 3 days, our little journey in Hong Kong came to an end and we took the plane to Japan, our main part of the trip. 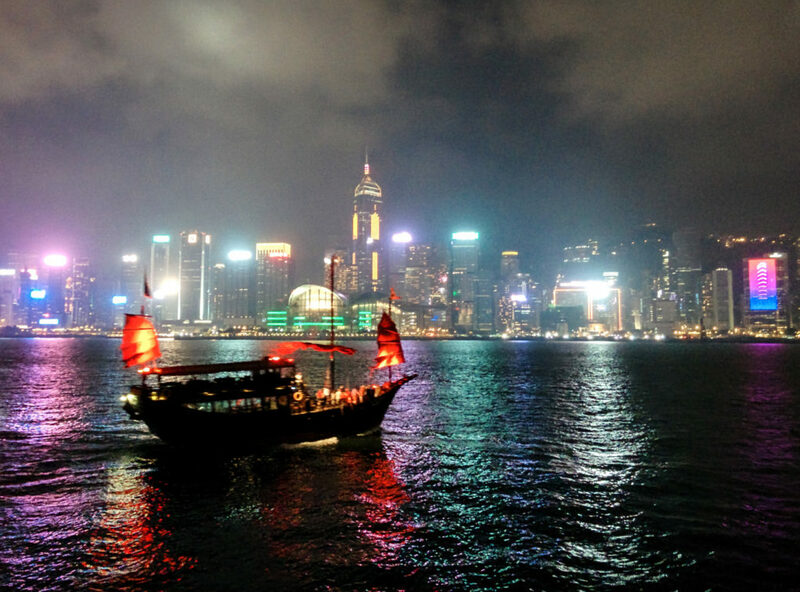 No trip to Hong Kong is perfect without the tacky red boat picture against the skyline. So here we go! 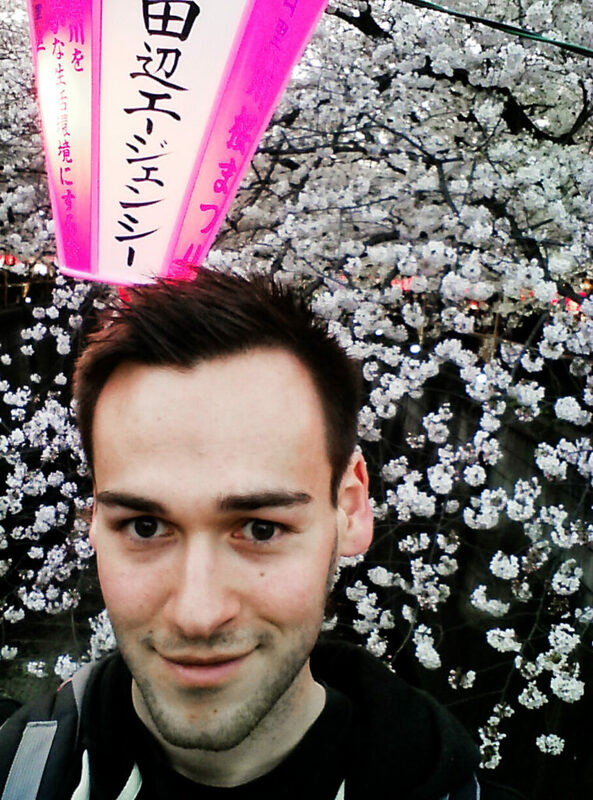 Next week I’ll tell you all about my adventures in Japan! Stay posted, sign up for the newsletter and don’t miss the next post.